The voyage included a large contingent of scientists from IMAS, the University of Tasmania, the ARC-funded Antarctic Gateway Partnership, the Antarctic Climate and Ecosystems (ACE) CRC, the Australian Antarctic Division (AAD), CSIRO, Edith Cowan University, and universities from around the world. 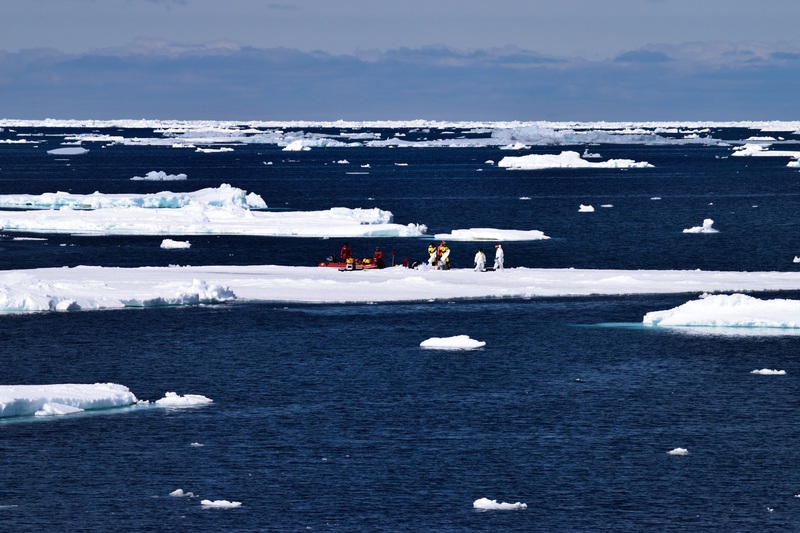 Despite an extremely early sea ice retreat reported in the spring the voyage encountered localised areas of very thick, rafted and ridged sea ice, requiring some flexibility on the part of the researchers. This is not necessarily a paradox, since northerly winds can blow sea ice up against the continent where they are compressed, reducing the extent but increasing thickness. Nevertheless, the science team had a very successful voyage, with 73 CTD casts, nine sea ice stations, and many litres of ‘underway’ water samples (i.e. samples collected whilst the ship is in transit) that will contribute to the scientists various programs. 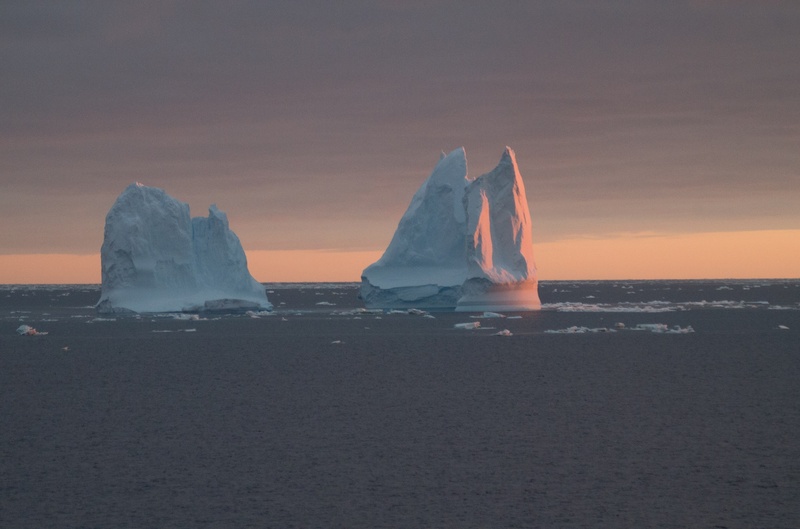 The sea ice team lead by IMAS’s Dr Delphine Lannuzel was focused on the role that sea ice plays in the Southern Ocean ecosystem, and in particular the accumulation of iron; iron scarcity is a major limiting factor on productivity in the otherwise nutrient-rich Southern Ocean. This work involved drilling through ice floes, sometimes as thick as 2.5 m, to take samples of the ice itself as well as the seawater underneath. The concentrations of iron are so low that even the proximity of the steel ship could contaminate the results, and meant that stations had to be a minimum distance from Aurora Australis; hence the ice stations needed a very careful balance of scientific requirements with the management of risk associated with working on drifting ice floes. 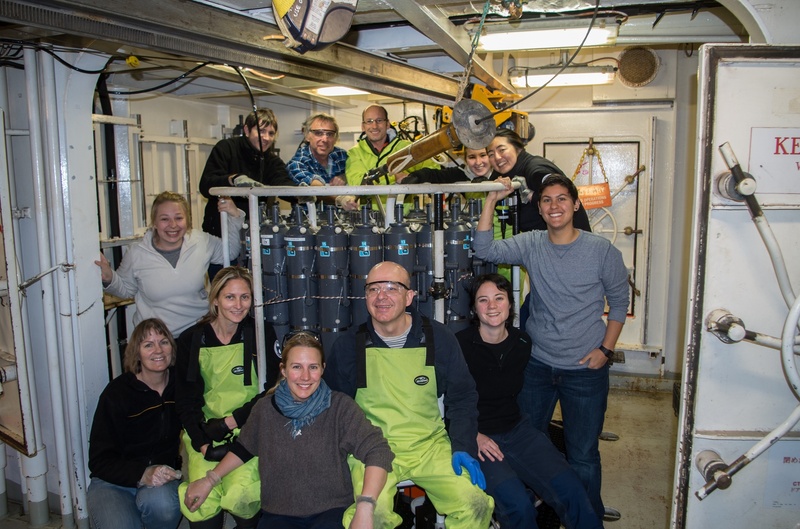 The physical oceanography team was focused on gathering data on ocean ice shelf interactions using CTD measurements, where CTD stands for Conductivity (a proxy for salinity), Temperature and Depth. The CTD is a unit that can be lowered from the ship to the sea bed, gathering data not just on temperature and salinity, but also oxygen, ocean productivity and ocean currents. Special bottles are also attached that can be remotely triggered to take uncontaminated seawater samples at any depth. One of the key scientific goals of the voyage was to revisit the region of the Totten ice shelf, to extend data collected there by Aurora Australis in 2014/2015 on a cruise sponsored by the ARC-funded Antarctic Gateway Partnership. The Totten Glacier is a huge drainage of land ice into the ocean, and is the only ice sheet in East Antarctica that is observed to be melting, largely by the intrusion of warm, deep water from below. Hence, understating changes to the temperature and salinity of the seawater in that region is an important priority. The region is surrounded by very thick sea ice, too thick for icebreakers to travel through, and so access to the area is governed by the fleeting presence of ‘leads’, openings in the ice pack that allow the ship to pass through. Unfortunately, despite an initially smooth passage into the Totten region, the ship hit thick ‘fast’ ice, and with a deteriorating weather forecast it was necessary to retreat to the Dalton polynya. A polynya is a large area of open water within the ice pack, that is crucial for sea ice production, and has an important role in impeding or allowing warm, deep water to reach the underside of local ice shelves. The team had better luck accessing the Mertz Glacier region, which has seen very big ocean and sea ice changes since 2010, when a vast chunk of the Mertz ice tongue measuring 78 by 35 km calved off. 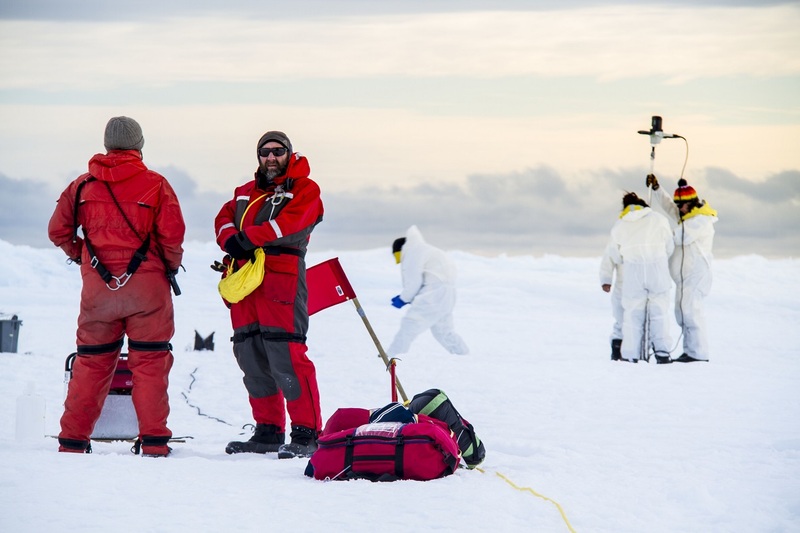 The team was able to repeat surveys along the front of the remaining ice shelf, providing valuable information about the water flowing into and out of the area underneath the ice shelf. This transect also provided the unique opportunity to take shipboard measurements of the freeboard – the height above the sea surface – of the remaining ice shelf, which can be compared with estimates from satellite altimeters. The team also had the chance to survey the rarely-visited Ninnis Glacier region, another area thought to have changed following a massive calving event some decades ago. In a very busy 24-hour window the team made 14 CTD casts, as well as surveying the bathymetry of the region. Seawater samples gathered during CTD profiles will be used not just to calibrate the sensors on the CTD itself, but also to give information about the chemistry of the ocean. This includes inorganic carbon concentrations (team lead by Kate Berry – CSIRO) and tracers giving information about the ocean circulation of the past (Dr Taryn Noble – IMAS/Antarctic Gateway Partnership). Phytoplankton abundance and health in the top 150 m of the water column was assessed by collecting seawater samples for on-board analysis of chlorophylla, photosynthetic performance and light-adaptation states. Results clearly show large spatial variability between the Dalton, Mertz and Ninnis Polynyas. Large volume in situ pumps (ISP) were deployed in the water on 8 occasions in the Dalton and Mertz polynyas to assess iron and organic carbon export flux to the seafloor. The pumps were left in the seawater for 1.5 h to pump 350 L of seawater at 100 m and 350 m depths. The 142 mm diameter filters were recovered and 25 mm punches were collected for analysis of particulate metals, 234-thorium activity, POC and PON content, and DNA. From the POC/234Th ratio of sinking particles and the 234Th flux, the export of flux of POC, PON to the sediments will be calculated. The data collected on this voyage highlights the continued importance of in situ fieldwork, even in an era of satellite observations, and the global importance of the Australian Antarctic Science programme. Most of these scientists were at the early stages of their research careers, and the enthusiasm and collaboration of these young scientists helps to ensure a very solid foundation for the future of Antarctic research. Huge thanks is also due to the crew of the Aurora Australis, and the Australian Antarctic Division’s Science Technical Support team. Without their skill, hard work and professionalism none of these achievements would be possible. Dr Hobbs is interested in observed trends in Southern Ocean sea ice cover, and improving climate model estimates of the high latitude Southern Hemisphere circulation. Dr Lannuzel’s research interests lie in the study of trace metal distributions, speciation and biogeochemistry in polar regions.